Using this option the currently open project's name can be changed. 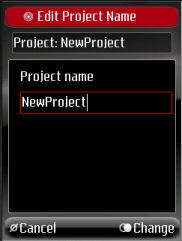 In the text field a new project name is entered. Selecting Change changes the currently open project's name. Pressing cancel returns to the Project Options without changing the project's name.